If you are a Google Chrome user, you might have experienced lagging issues while switching tabs, scrolling through pages or sudden Force close in Android. It doesn’t matter what phone you have; you might face this issue. 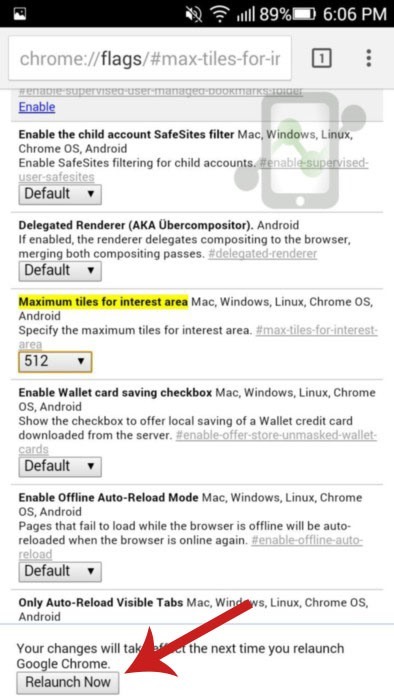 After Google Chrome went open source, it offers many options to manage its internal settings. By default, Google Chrome uses a minimal amount of your RAM. But, what if you have enough RAM & still you are facing lag? You can increase the RAM share of Google Chrome by a straightforward method. This method hardly takes a minute and it’s too easy to follow. 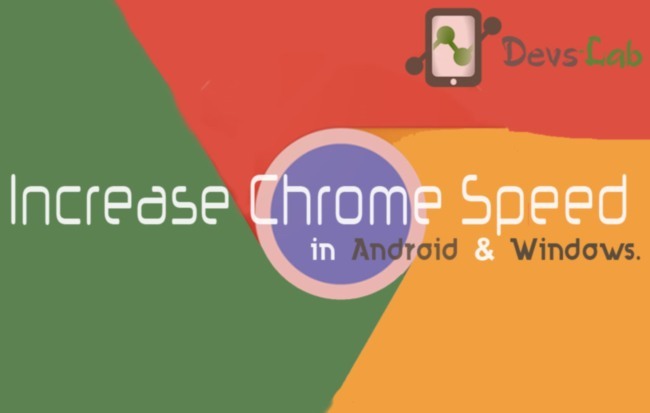 So, let’s get started with Increasing Google Chrome Speed on Android and Windows. Step 3. Now, Click on the option at which the arrow is pointing in the above image. By default Google Chrome is restricted to use very less RAM of your device which leads to lag & crash. Now, depending on the RAM of your device, select RAM share. For Eg : If you have 1GB of RAM, selecting 256MB would be a wise decision if you use chrome normally. But, if you use browser for long time, select 512MB (Maximum). If you have a device with 512MB RAM, select 128MB and so on. In my case I have a 1GB RAM device but use my browser too much. Make sure you select the best option as per your device because if you select the Maximum one, it would slow down your device. You can experiment the best Option for you by changing the limit & check the performance. Also check : Find and Fix Malware infected Android phone. Step 4. 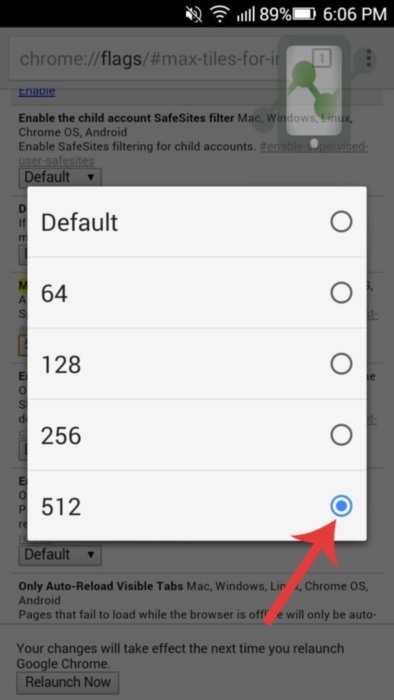 Once you have selected the limit, Relaunch Chrome App by clicking on Relaunch button at the bottom. Step 5. After that, clear all cache & cookies. Now, you might experience some difference in speed and switching tabs. If you are facing any instability, select lower limit value & check. This method works for Android, Windows, Linux, Mac & Chrome OS only. While allowing high memory usage to Google Chrome would increase its efficiency and working, it would reduce the performance of other Apps when used simultaneously. While other apps might struggle to get RAM allotment, when Chrome is being used. In order to avoid this scenario, select the tiles after thinking about it and your phone’s available RAM. 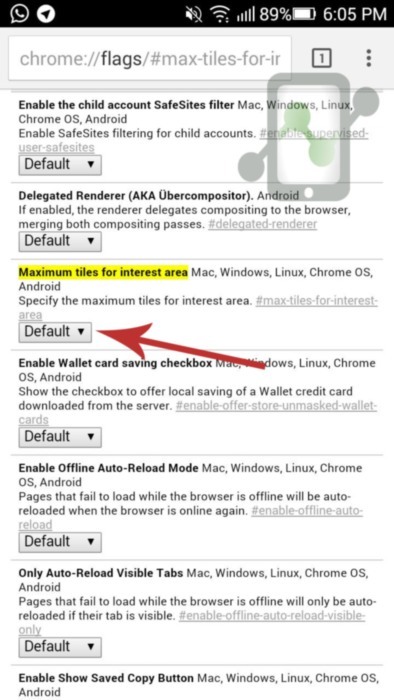 Do let us know if this method improved your Chrome speed?